In most well stocked larders in the early 20th century an inquisitive child might discover a little bottle of crimson essence labelled carmine or cochineal. The cook used it to colour the icing on birthday cakes or for flavouring. It was also used as a natural dye for colouring sweets, medicines and cosmetics because it was neither harmful nor toxic. But originally cochineal was processed as a dye for textiles. The cochineal dye was, and still is on a smaller scale, obtained from a sessile parasite which is native to tropical and subtropical South American regions. The insect survives by sucking the juices and nutrients principally from the Opuntia or paddle cactus, a genus in the cactus family which is often referred to as tuna in the Canary Islands. Travellers taking a close look at a prickly pear plant, especially on the southern hillsides of Tenerife, will often discover not only the reddening and delicious prickly pear fig flowering on the rim of the cactus leaf or paddle, but also a mass of tiny dark-coloured insects under an ashen-white, waxy substance which the nymphs secrete to protect themselves from the sun. It is from the female of this parasite that the carmine dye is taken. The male is grey and has wings. The female is wingless and is a much more impressive dark blue-red colour. Like most living species she does most of the hard work. On the other hand it is the duty of a solitary male to cope with three hundred females for the purpose of reproduction, enabling each female to then lay hundreds of eggs. Producing carmine dye from the beetle is not an easy task but during its heyday in the 1860s and 70s tunera farming for the cochineal insect proved very profitable. A thriving cochineal industry in the Canary Islands survived until the 1970s although synthetic dyes had long before made the breeding and harvesting of the cochineal beetle too costly and labour intensive. It required 70,000 beetles to provide a single pound of cochineal dye as well a lot of women wearing layers of clothing as protection against the cactus thorns in order to gather in the beetles. 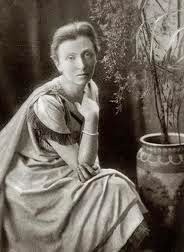 Olivia Stone, nineteenth century traveller and author of Tenerife and Its Six Satellites, explored the Canary Islands with her husband, John Harris Stone in the 1880s. She described women scraping the insects into large flat metal trays. This procedure occurred when females of second generation of beetles were ready to lay their eggs. The trays of insects would then be placed in ovens to toast. The beetles could also be put into boiling water and later dried in the sun. She also described insects being mixing together with black sand in a linen bag several feet long which would then be swung back and forth by men holding each end of the bag until the juices seeped out. In the industry’s halcyon days, as Olivia Stone described them, before the discovery of synthetic dyes, cactus farmers could make between 75 and 100lbs from an acre of ground. It was a very profitable business and labour in those days was extremely cheap. 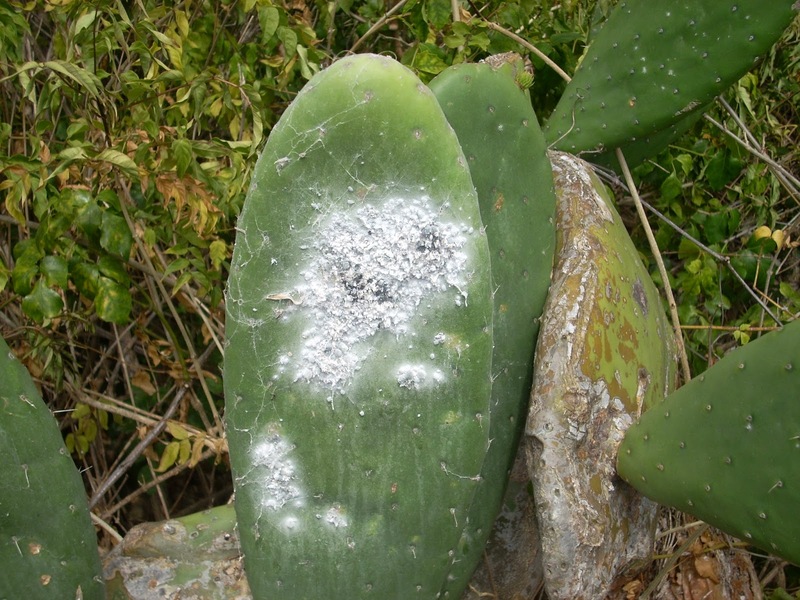 The Spaniards discovered cochineal in the 16th century during their South American conquests, particularly in Mexico. The Aztec people were using it to dye their blankets and clothes but also squeezed the beetle with their fingers and rubbed the resulting scarlet juice or blood onto their faces as war paint. Historians suggest the amazing Aztecs had been cultivating the beetle since the 10th century. 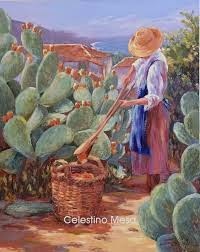 Most inhabitants had cactus growing in their fields and were very careful to protect the beetles from rainstorms. However they never realised the economic significance of their precious insects until the Spaniards began to harvest them and cochineal became one of the colonies’ principal exports. 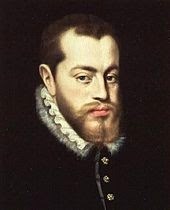 By the 17th century the colouring of fabrics had become one of Europe’s most important industries and cochineal dye, imported from Mexico, Peru, Bolivia and Chile accounted for a fifth of the Royal income during the reign of Philip II. 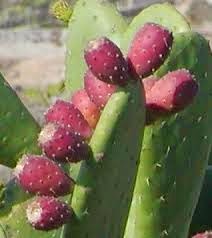 The king is thought to have described cochineal as a commodity equal to gold and silver. The Spaniards were able to maintain secret their discovery and the process involved in producing the dye for many years. They considered the cochineal dye industry so important to their own economic interests that they encouraged a lack of knowledge and even the use of deceit to hide the secrets of the tiny prickly pear beetle. However, French botanist Nicolas-Joseph Thiéry de Menonville discovered the Spanish mystery in 1777. He smuggled some insects out of New Spain and attempted to cultivate cochineal in Haiti with scant success. The climate was too humid. The French also planted cactus in Madagascar and Algeria. The plant flourished but the beetle did not survive the climatic conditions and their experiments failed. Even the Spaniards found no success in their early attempts to bring the industry across the Atlantic to Europe and they could not compete with their American colonies. 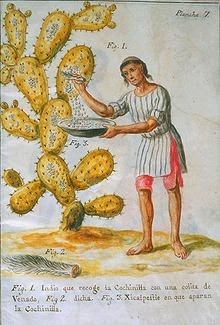 However, just before Mexico became independent in 1836, the cochineal beetle was introduced to the Canaries where the Opuntia variety of cactus for the production of the prickly pear fruit, the higo pico, was already a success. The climate and temperature was perfect. Production spread rapidly throughout the islands despite initial fears amongst landowners that the industry would damage their traditional vineyards. Nevertheless, when they realised the high profits they could make from the beetles they took a very keen interest. At the same time South American countries began to favour coffee production on a large scale. 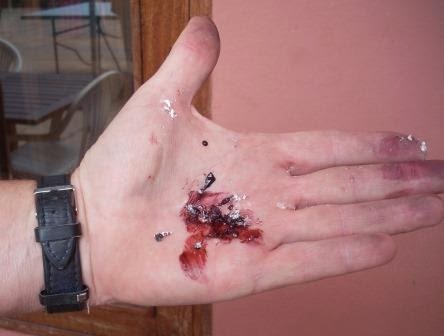 This led to the cochineal industry in the Canary Islands becoming even more important. In fact such was the monopoly that landowners were able to set their own high prices. The Canaries flourished for many years on the cochineal industry. It replaced many of the islands’ famous vineyards which had been so cruelly devastated by the oidium tuckeri, the powdery mildew fungus which thrives in the mild, humid conditions found in the northern valleys of Tenerife and other mountainous islands. British Consular reports reveal that cochineal even replaced wine as the Canary Islands’ main exportable product to British seaports. In fact cochineal dye from the Canary Islands also played a significant role in the development of the English textile industry during the industrial revolution. 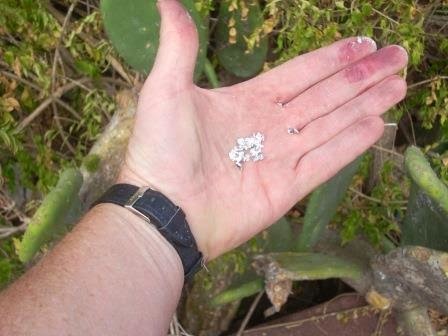 There is little doubt that English orders for cochineal helped turn many of the rugged volcanic malpaís badlands into productive cactus plant enclaves. In 1831 the amount of dye powder bought by textile merchants in England was a tiny 8lbs. Ten years later exports had risen to over 100,000lbs. In 1850, the wine trade having been virtually wiped out by disease, cochineal dye exports to Britain were an estimated 783,000lbs. By 1861 the figure had risen to over 2,000,000lbs. But there was yet more to come. Production of the dye and its exports to Britain reached a peak in 1869 with over 6,000,000lbs. One of the principal clients for cochineal dye was the British Government. 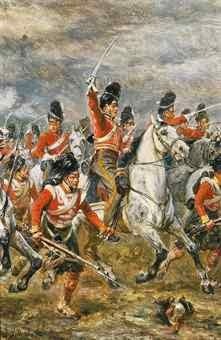 Originally only for officers' uniforms, cochineal became the vital ingredient in conjunction with certain chemicals which was used to produce the brilliant scarlet of the famous British Army tunics, so fearlessly worn in battle but which made such easy targets for the enemy.